Greetings everyone. I'm new here. Hoping to get help to operate the Omron V400-R2 barcode to the Mitsubishi QJ71C24N so that they can communicate the two devices with the correct method. PLC: Mitsubishi: Q03UDVCPU; barcode: Omron V400-R2; serial communication module: QJ71C24N. 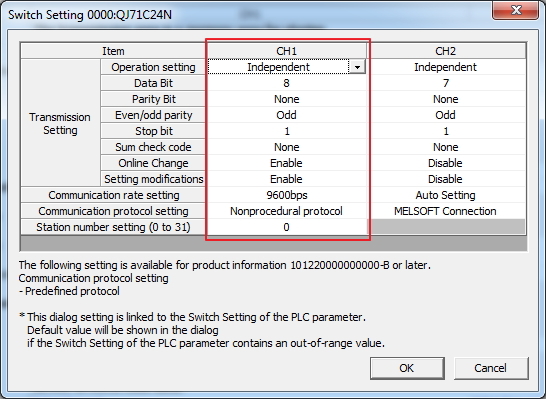 I use RS 232 communication cable, I have tried using predefined protocol and non protocol procedures but still can't communicate the two devices. Can you be more clear about your problem ? I would use pre-defined protocol. I use barcode omron V400-r2 to PLC mitsubishi. I have followed your advice and fixed the ladder but both devices still not connected. Like the picture I attach, the protocol status only "sending".. NO error but why the SD and RD indicators in the QJ71C24N series module are not ON.. ? Looks to me that you have send a string but there is no reply. In your pre-defined protocol you can set the wait time. This is probably on default infinite wait. You should change this to 5 sec or so. So you will get an error after this time when there is no answer. I've tried giving the monitoring time = 7s and try different time too. Its respon with error in module. But i cant see indicator the SD lite up when I activated X30. I dont know if I do something wrong with this predefined protocol ? Thankyou Mr. Wasan. I have tried to use this method too but no response when I trigger the device to barcode.. Does barcode wiring use cognex and omron v400-r2 the same? There are some different but use wiring RXD TXD and GND are same. I think you should use serial communication software (e.g. hyperterminal, hercules) to check how data come from Barcode Scanner first because either PreDefined Protocol or Non Procedure Protocol would check data frame that match with their data frame or not.If not error would occur. 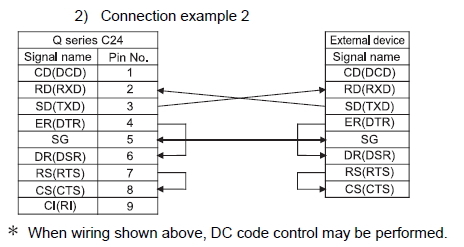 Maybe you should swap RXD and TXD barcode scanner with QJ71C24N and you should connect pin 4 (DTR) to pin 6 (DSR) and pin 7 (RTS) to pin 8 (CTS) too. There are some different but use RXD TXD and GND are same. I think you should use serial communication software (e.g. hyperterminal, hercules) to check how data come from Barcode Scanner first because either PreDefined Protocol or Non Procedure Protocol would check data frame that match with their data frame or not.If not error would occur. can I know which one port can be use to connect the cable barcode RS232 to (RJ45/vga port/ usb/ HDMI) in notebook? You should use USB to RS-232 cable as this when you install driver and connect it there are COM port (e.g. COM3) generate on device manage then use HyperTerminal or Hercules connect COM port with Barcode Scanner and check how data come from it. thankyou for the advice Mr. Wasan.. I will try it..
thankyou for the advice sir.. can't I make a wiring manual cable with RS232 to LAN port notebook ? If you need to convert LAN to RS-232 you should use Serial Device Server to create virtual com port same as UPort 1100 but for this project I don't recommend beacause it has more price than USB to RS-232 Converter. For detail please check link below. Arre you trying to execute protocol 1 or 2 ? "start monitoring" X3 is ON and the barcode is successfully connected, when I press the "scan button" on the v400-r2 barcode, finally the predefined reading is successful and the data is stored on the D1000 like the image I attached. but for the second reading, when pressing "scan button" the data on D1000 does not change ... I have to select "stop monitoring" in the toolbar then repeat by pressing X30 again so that the second reading can be done, is it really the way it works like that? and even in M0 the status is always OFF? i have done do your advise to check with hyperterminal and now the both devices can connection. I also have tried non procedure and that working now. I just press the "scan button" in V400-r2 for reading barcode and it can read different codes repeatedly without select the X83 and even in M0 the status is always OFF? is it really the way it works like that? M0 will on one cycle scan you cannot see it.It is OK as long as M1 is off if it on that means there are some error occur. I learned a lot after completing this project. Really thankyou Mr. Wasan..